COLORADO SPRINGS, Colo. — The 2018 Professional Cyclocross Calendar (ProCX) rolls back into action Dec. 1-2 following the Thanksgiving holiday with dual events in two distinctly different parts of the country. With its iconic beach shoreline on the New England coast, NBX Gran Prix of Cyclocross returns for a 14th year in Warwick, R.I. It is the first time the event will host a Union Cycliste Internationale-inscripted Category 1 race for elite women and men. A pair of Category 2 race days will be held at Resolution ‘Cross Cup in Garland, Texas, the only ProCX stop in the Lone Star State. Eighteen ProCX events have been held across the U.S. since the first weekend of September. Having moved into the top position for Elite Women in Week Five of the calendar, Ellen Noble (Kennebunkport, Maine/Trek Factory Racing CX) continues a solid lead by more than 150 points. She has finished on the podium in all 11 ProCX races this season, which include seven victories. Her most recent victory was at the first day of the Verge Northampton International Cyclocross presented by Cycle-Smart (NohoCX) in early November. For the Elite Men, Kerry Werner (Birdsboro, Penn./Kona Maxxis Shimano) retained the No. 1 ranking, a spot he has held since winning both days at Deschutes GO Cross in Roanoke, Virg. Sept. 1-2. Most recently, he earned two silver medals at Supercross Cup in Suffern, N.Y., Nov. 17-18. A mere 48 points separates the four Elite Women ranked just below Noble in the ProCX standings. Maghalie Rochette (St-Jerome, Quebec/CXFever p/b Specialized) is in second place, retaining top points earned from four podiums at C1 races early in the season. Rebecca Fahringer (Concord, N.H./Kona Maxxis Shimano), in third, scored four podiums in the two weeks leading into the Thanksgiving break, with a second and third at NohoCX and a second and her first ProCX win of 2018 at Supercross Cup. Sunny Gilbert (Ellisville, Mo./Van Dessel Factory Team) continues in fourth place with Kaitlin Keough (Colorado Springs, Colo./Cannondale p/b cyclocrossworld.com) in fifth place. A similar scenario developed for the Elite Men, with 49 points separating the four athletes below Werner. Propelled by two podium finishes at the Major Taylor ‘Cross Cup Nov. 17-18 in Indiana, Jamey Driscoll (Pivot Maxxis p/b Stans DNA Cycling) moved into second place overall. Tobin Ortenblad (Santa Cruz, Calif./Santa Cruz/Donkey Label Racing) slipped to third. Curtis White (Delanson, N.Y./Cannondale p/b CyclocrossWorld.com) and Lance Haidet (San Luis Obispo, Calif./Donnelly Sports) rounded out the Top 5. White was the big winner for November, raking up all four C2 wins at NohoCX and Supercross Cup. The penultimate C1 race of the ProCX season will cast a spotlight on NBX Gran Prix of Cyclocross this weekend at Goddard Memorial State Park in Warwick, R.I. The course offers twists, turns, rooty descents and the legendary long beach sections along Greenwich Bay for two days of racing. It is also the final weekend of competitions for the 2018 Vittoria Northeast Cyclocross Series presented by Clif Bar and Cycle-Smart. The Vittoria Series began in Gloucester, Mass., in mid October, followed by events in Northampton, Mass. and Suffern, N.Y. in November. With a total of eight events in the Northeast, the Vittoria Series is the longest standing, UCI cyclocross series in the United States. Fahringer leads Noble by a slim 10 points in the elite women’s standings. For the elite men, Curtis White has swept all six races so far and is set to defend his 2017 Vittoria Series title. Top ProCX contenders joining Fahringer and Noble in the Elite Women’s field will be Keough and Anthony. Joining White will be Cannondale p/b Cyclocrossworld.com teammate and reigning U.S. Cyclocross National Champion Stephen Hyde. They will be challenged by ProCX leader Werner. A pair of C2 races will be held in the Dallas-metro area this weekend for the seventh annual Resolution ‘Cross Cup. On Saturday, amateur cyclocross races will be the third and final event of the North Texas Cyclocross Race Series (NTXCX). All races are held at Winters Park in Garland. This year’s course includes a new wooded section and varied use of the steep contour at Winters Park Amphitheater. The popular BMX-style pump track and creek bottom “wall” climb return. USA Cycling ProCX features the premier cyclocross events in America and uses an overall ranking system to determine the best individual male and female ‘cross racers over the course of the season. The 2018 ProCX calendar includes a total of 39 UCI-inscripted category 1 and 2 races across 19 states and the District of Columbia. The calendar spans from September to December, culminating with the USA Cycling Cyclocross National Championships in Louisville, Ky., Dec. 11-16, 2018. 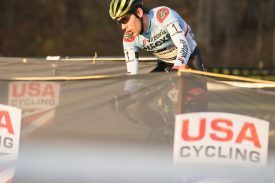 To learn more about USA Cycling, visit usacycling.org, and follow ProCX all season on Twitter – @USACyclingLive (#ProCX).